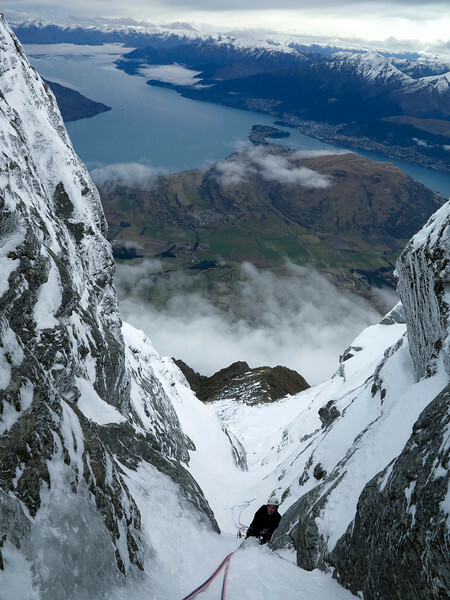 Before this all happened, things had started well with members of the New Zealand Alpine Team and a host of accomplices heading over to Queenstown to spend the week climbing. We were initially treated to great spring-like conditions with fat ice and good snow. Dan Joll and Allan Uren headed over to the Telecom Tower on Saturday 10th and climbed a new route (Half-Century Celebrations, M6), both to celebrate Al’s 50th birthday and to coach Frazer Attrill and myself nearby on Friday’s Fool (M4). Finding fat ice and with plenty of energy to burn (at that stage), we completed the climb and headed back to Queens Drive to solo Number One Gully (M2) while looking for Jono Clarke (who was soloing Friday's Fool looking for us). The following day Frazer and I climbed Altered States (WI2) while Dan Joll, Stephen Fortune and Jono Clarke worked an insanely overhanging dry-tooling project route (The Fly, probably M12), which can only be described as ‘futuristic.’ Danny Murphy and friend claimed a new route on the Flight Deck nearby. The next day’s climbing was over before it had began as the tragedy on Queens Drive played out. All major climbing aspirations were curtailed for the rest of the week with the team electing to climb predominantly dry- tooling routes on the Telecom Tower. Consistent snow and poor weather made matters more difficult. Several first ascents, including the 2 star turfy corner route On General's Orders (M3+) by Jaz Morris, Danny Murphy and Frazer Attrill, and the first free ascent of Blow Up (M8) by Jono Clarke were highlights of the week. The festival proper began on Friday 16th with various groups heading off for ice, mixed and snowcraft instruction. The traditional Grand Traverse Race on Sunday took place in atrocious conditions, with only Danny Murphy and Mike Buchanan completing the traverse in the respectable time of 4 hours 15 minutes. Good effort lads. Thanks to Dan Joll, Ben Dare, Al Uren, Di Drayton, Jono Clarke, Stephen Fortune, Danny Murphy, Frazer Attrill, Tiff Stephens, Ari Kingan, Pete Harris, Peter 'Rampage' Ramage, Jason Horrocks and all others for instruction, sharing a rope, and good company throughout the week.